In the national energy market, it would appear nothing is ever as it seems. In electricity, they said demand was rising. But it was falling. Prices had run too high. Still, the network companies got their price rises. Now in gas – as the scare campaign over East Coast gas shortages hits fever pitch – there is one aspect which has gone unreported. You won’t hear it from industry and you won’t hear it from the official forecaster, the Australian Energy Market Operator (AEMO). But like electricity, demand for gas appears to be falling. And yet the retailers are still gunning for 20 per cent price rises. The scapegoat for the price spiral in gas is the same as it was in electricity: renewable energy and, of course, the good old carbon tax. Their demonisation proceeds apace. Behind this agenda is the push to expedite risky, environmentally damaging coal seam gas projects. It is an agenda which urgently needs to be exposed. To this end, we can start by looking at the forecasts for demand. The first thing that you will notice is that they are hard to find. But if you look long enough you will discover a spreadsheet on the AEMO website. AEMO divides its consumers into three categories: gas-fired power generators, mass market (residential and small business consumers) and large industrial consumers. The spreadsheet shows that for the period between 2014 and 2033, a growth rate of 1.2 per cent per annum is predicted for both mass market and large industrial user demand. A decline of 0.4 per cent for the generators is forecast. Demand in the east coast market is forecast to rise in by 0.9 per cent a year in the period 2014 to 2033, despite skyrocketing prices and cries from big industrial gas users who lament a doubling in prices for their long-term contracts. This, while the retailers are pushing the Independent Pricing and Regulatory Tribunal for 20 per cent price increases, something mooted to be the harbinger of further price hikes. Bear in mind, AEMO – which overcooked its electricity forecasts by a large margin – is 40 per cent backed by industry. Again, as was the case with electricity forecasts, it seems AEMO’s estimates will prove way too high. For one, they don’t appear to account for the effect that heavy price rises will have consumer demand. Stung by rising charges for electricity, water and gas, consumers will simply use less gas. The argument run by the gas industry is that there is a shortage of gas to supply the domestic market. And indeed there is a shortage. But it’s one brought about by the gas producers, who are diverting supplies to the LNG export terminals at Gladstone in Queensland. And they’re doing it because shipping LNG to Asia is far more profitable than supplying the local market. By 2019, the LNG export business on the east coast of Australia is expected to be 2.4 times the size of the total eastern domestic market. 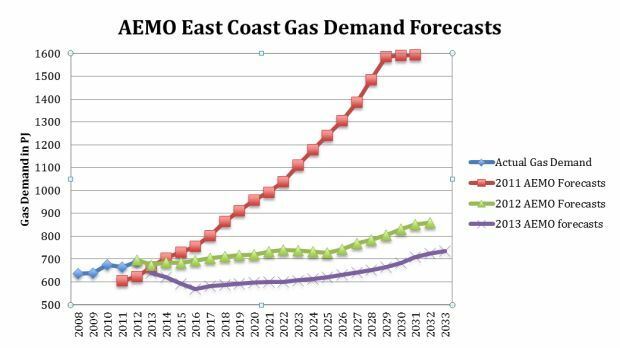 AEMO, in its annual appraisal of the East Coast market, says gas demand for LNG facilities in Queensland is “projected to rise from zero to approximately 1,450 petajoules between 2014 and 2019, posing significant challenges to producers to supply both domestic demand and LNG exports”. According to analysis from CS First Boston, the advent of this export market has had the effect of raising the wholesale price of gas from $3-4 gigajoules to a forecast $7.50 – $10 GJ. The wholesale price of gas has already begun to rise towards export parity for large industrial users who operate on contracts. It’s a rise which has lead to some perverse outcomes. The hitherto efficient gas-fired Swanbank power station in Queensland, for instance, announced it was closing for three years. It’s closing because it has become more profitable for Swanbank to sell its gas than to burn it and sell electricity. The station’s owner, state government-owned Stanwell Power Corporation, will instead re-boot the coal-fired Tarong power station to meet electricity demand. It is cheaper to produce electricity from coal than from gas, but coal produces almost twice the greenhouse emissions. A Stanwell spokesman said the decision was all about revenue. ”We can generate more revenue by selling the gas than we can if we were to take the gas and burn it for electricity generation,” the spokesman said. Stanwell bought future gas entitlements for the Swanbank E power station from the major gas companies for three years. ”If we were to take that gas, then burn it for electricity – in the current market where we have a huge oversupply in Queensland at the moment – well we’d make more just selling the gas,” said a spokesman. The scare campaign being run by the gas industry has a major flaw in its logic, says Bruce Robertson, the analyst and economist who exposed the previously excessive electricity forecasts by AEMO and the concomitant overcharging by electricity networks. “When looking at the supply and demand equation for gas on the east coast there are three variables: supply, demand and price. Price is the variable that reigns supreme. Already, consumers are battling huge rises in water and electricity charges. They can ill-afford any rise in gas prices. 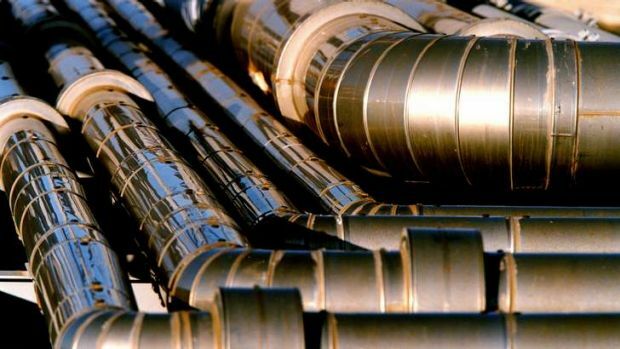 It’s the same deal for Australia’s manufacturing sector, which is already being gutted by escalating costs. The large industrial consumers are being stung as old contracts roll over. The new supply contracts will be struck at prices closer to what it costs foreign buyers to get Australian gas. The big winners are Origin, Santos, BHP, Beach Petroleum and to a lesser extent AGL. The losers: almost everybody else. Robertson puts some of the blame at the feet of the industry forecaster AEMO, citing its poor track record of overestimating electricity demand. This, he says, lent the industry the cover to ‘gold-plate’ its networks and ramp up charges. “AEMO forecast increases in demand for electricity when demand had been falling since 2009-10. I can confidently predict that their forecasts in 2014 will be downgraded yet again following downgrades in each of the last three years,” Robertson says. AEMO is regarded as the authority on forecasting. “Billions of dollars of infrastructure have been built based on these forecasts that have no basis in the real world,” says Robertson. The same factors are at work in the Eastern Australian gas market. “Rapid price increases will lead to lower demand and substitution,” says Robertson. While these 2013 forecasts may appear more reasonable with modest falls in demand until 2016, the devil is in the detail. It’s the forecast rises in consumption among mass market and large industrial users – pegged at 1.2 per cent per annum apiece – where AEMO “really does enter fantasy land”, he says. Meanwhile, the scare campaign is being used to justify short-circuiting the approval process for coal seam gas projects, despite the risk of damage to farmland and the growing opposition of local communities. Most recently there has been the sweetheart deal between Santos and the NSW government to speed approvals process on a major CSG development in the Pilliga state forest near Narrabri. NSW Deputy Premier Andrew Stoner signed a memorandum of understanding with Santos last week, designating Pilliga a ”strategic energy project” and guaranteeing a final decision on whether or not to approve the project by January 23 next year. Despite rancorous opposition, AGL is pushing ahead with its CSG trials at Gloucester. In Victoria, the moratorium on CSG continues.